Paul Dunne makes it onto the board usually reserved for the glitterati at Food Game, South Lotts, Dublin. 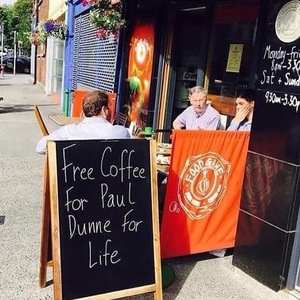 Posted in Sports and tagged blackboard, food game, Paul Dunne at 5:19 pm on July 23, 2015 by Aaron McAllorum. I’d be a bit embarrassed ambling in aged 70 for my umpteenth free latte but it’s a nice idea. Our lizard overlords will be harvesting for our flesh by the time Paul Dunne is 70 thus, thankfully saving him from any potential embarrassment. What do you mean, they’ll be killing us all off at 60 or something. Will we be shipped off to the Beacon hospital to meet our maker once the candles mount up on the cake? shipped off to the old greyhound facility to be made into soylent green, no doubt. Those opening hours are ridiculous.